CENTRAL PARK — When he's not working as a scientist at Columbia University, Chris Grigsby spends his weekends setting broken bones and responding to drug overdoses in Central Park. While the city's fire department and other hospitals might respond to emergencies in the general area, a little-known group of EMTs called the Central Park Medical Unit, which is run strictly by volunteers with day jobs, focuses on keeping the 843-acre park and its surrounding streets safe, and does it for free. Grigsby, 32, recalled some notable incidents he's responded to over the one year he's worked with the agency — from the drug overdose of a man he swears looked just like Louis C.K. (it wasn't really him) to a Swedish man who got hit by a hot dog stand umbrella. He still can't get enough of the job, Grigsby said. "It keeps life in perspective," he said on Sunday while on tour. "Seeing people with real problems makes things seem not so bad." Just after 7 p.m. on Sunday, Grigsby and his fellow volunteer EMTs Jeff Soules and Fresa Esteve had dropped off a woman at Mt. Sinai after a bicycling accident left her with possible broken toes, when another call came in: a car accident on Central Park West and West 81st Street. They jumped back in the ambulance and hightailed it down Fifth Avenue with lights flashing. Grigsby was quiet and calm as he manned the siren and carefully maneuvered around the cars at each intersection. As the first emergency medical responders on scene, the victim's injuries seemed minor, but they wrapped his neck with a brace just in case and transported him to New York-Presbyterian/Weill Cornell Medical Center within roughly 10 minutes. Each weekend, the CPMU, typically made up of three EMTs per ambulance, scours the park for people in need of help, whether it's as simple as a Band-Aid for a scrape or as serious as someone with head trauma. They respond to emergencies on the perimeter of the park, too, like when someone has a heart attack in an apartment on Fifth Avenue or an accident on Central Park West. Because the ambulance company is not-for-profit and uses money from donations to operate, patients do not need to pay for services they use. From Sept. 1, 2014, through Aug. 31 this year, the unit took 608 calls for a total of 1,600 hours of service, according to Soules. The majority of the calls they take are for trauma, such as a cut or a broken limb, followed by medical emergencies like a heart attack, Grigsby said. CPMU takes its patients to surrounding hospitals, like New York-Presbyterian/Weill Cornell Medical Center, Lenox Hill Hospital and the Mount Sinai hospitals. It largely depends on where the emergency took place and the nature of the call. For much of the day on Sunday, the CPMU volunteers, drove slowly through the park with their windows down in case anyone called for them. It was an unusually slow day, they said, even though there was a NYC Century bike tour and Komen Race for the Cure event in the park and a New York Road Runners race down Fifth Avenue. But the emergencies started coming in near the end of the shift at sundown. One little girl had fallen on her bike on West Drive inside the park and needed a Band-Aid, and further south on that road, the EMTs found a woman who had also fallen on her bicycle and could not walk. Her toes were bloodied and she needed medical attention. Speaking Spanish, Estevez translated for the patient as she was checking her vital signs. The woman could have broken her toes, but an X-ray was needed, so they took her to Mount Sinai Hospital's emergency room on the Upper East Side. Working at "the center of the universe," as Grigsby likes to think of it, the unit comes into contact with people from all over the world. They've never had an issue with a language barrier yet because there always seems to be someone nearby who can translate, they said. It helps, too, that in the pool of more than 100 volunteers, there are people with many different skills, including translation. Estevez, 23, who lives in the Bronx, is a translator for Columbia University and helped the woman who hurt her foot communicate with the other EMTs. Grigsby, an Upper West Side resident, studies biomedical engineering. "We have people from all walks of life, from medical students, to lawyers, to doctors and computer programmer like me," said Soules, 34, who works full time for New York University's law school and lives in East Harlem. "We don't require experience, but the biggest thing anyone can do is be available and be motivated to help out." Everyone who applies to join the volunteer agency must have taken medical training and be state certified, Soules said. CPMU gives many people a foot in the door. 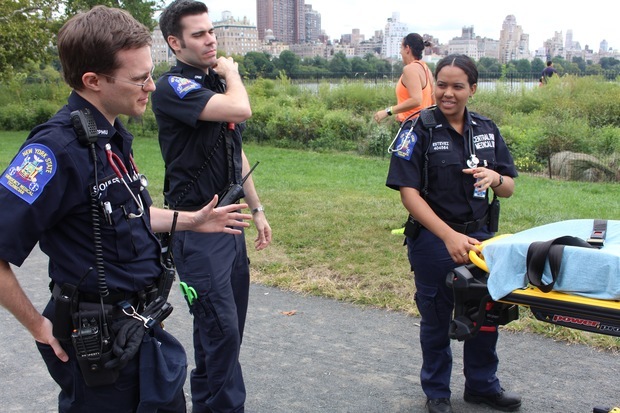 Those who want to get trained as an EMT can do so, so long as they put in the time. EMTs start as probationary members and go out with at least two other experienced EMTs and receive their training out in the field. Between calls on Sunday, Soules and Grigsby tested Estevez on her knowledge of how to use the company's new power stretcher and its Kendrick Extrication Device, or "KED," used to get people out of a car when there has been an accident. CPMU also trains its probationary members on its new equipment, including two customized ambulances that replaced two that were destroyed last year in a garage fire. Through donations, CPMU was able to customize their new ambulances to more easily fit under Central Park bridges and made the layout easier to move around in and help patients inside. Blinking lights were added to the doors as well, according to CPMU officials. The ambulances cost roughly $175,000 to $280,000. Soules said the new "buses" have helped the unit out tremendously because now they're more visible and can more easily help patients. CPMU has been serving Central Park visitors for 40 years, according to Soules. Because the EMTs know the park well and usually have three units out and volunteers on bikes, they typically respond in under three minutes. Because they aren't paid and act as free agents, the volunteers can take the time to respond to each emergency as they see fit, according to Soules. "Ideally, we can wait around for a half hour if we need to, leaving resources open," he said. "We never like to see people get hurt but it's good to be there when it happens." To directly reach the ambulance for help, call 212-585-0911.